This article mentioned that Nicole just recently returned from a 4 month vacation in Australia, and has conferred with Wong Kar-wai in Sydney. It also mentioned a recent interview with Nicole where she said she had freed up August for WKW. According to this article, Nicole met with Wong Kar-wai and costume designer William Chang in New York. Chang has started designing some cheongsams and other costumes for Nicole. The article also mentioned that the film is about this woman struggling to survive amidst the war and espionage. The love story will be a focal point, and WKW will highlight the beauty of Nicole’s inner reserve and mystique. CR: Finally you’re going to make a movie called The Lady From Shanghai with Nicole Kidman. WKW: We don’t know yet, but we know it’s about. CR: We know the character. WKW: Yeah, I..I..I… know there’s a character which I like very much to have Nicole to play. It’s a dangerous woman because..uh..and she’s in danger. CR: A dangerous woman who’s in danger…um…sounds good to me. CR: When do you start? WKW: Right, so I can enjoy my time to do all this research. CR: So that’s actually what you researching here now. This article quoted the Chinese film company who’s jointly producing this film as saying that “The Lady From Shanghai” will now have to start “early next year”. The company disclosed that it’ss putting up US$10 million in a joint venture with a foreign company to fund this film. Due to many factors (which he did not disclose), they missed Nicole’s schedule. So they will have to wait for Nicole. The article further mentioned that at the present time, only WKW is clear about the story line. And the cast is still not set, but will definitely include Chinese actors; although none has been selected. The article mentioned that Nicole has completed “Fur” and “The Visiting”, and is waiting for “The Lady From Shanghai”. Apparently, Wong Kar-wai has to consider “height” when casting for an actor to team with Nicole. So he may bypass one of his favorites, Tony Leung, and may consider Chang Chen. Another site reported that Wong Ka-wai will be part of the jury for this year’s Cannes Film Festival, and that he’s also preparing two films, “The Lady From Shanghai” and another one about Bruce Lee’s mentor, which will star Tony Leung. Taiwanese actor Chang Chen is now rumoured to play Nicole’s love interest in “The Lady From Shanghai” instead of Tony Leung. The article also mentioned that the film about Bruce Lee’s mentor should start filming the second half of the year, while the other article mentioned April as a start date for “The Lady From Shanghai”. This article confirmed that Nicole has already signed to join “The Lady From Shanghai” and filming will start “the second half of the year”. Mentions that she will be filming in New York. Speculation that either Rachel Weisz is replacing Nicole Kidman in “The Lady From Shanghai”, co-starring in the movie or starring in another movie altogether, therefore “The Lady From Shanghai” is postponed. “Golden Globe winner Rachel Weisz is happy because she doesn’t have to pretend she’s pregnant for the next movie, The Lady From Shanghai, by Wong Kar-Wai. The actress is 5 months pregnant and she won’t need to hide the bump. This article mentioned that because of Wong Kar-wai’s high standards, the script could not be finished on time. Consequently, the start date for “The Lady From Shanghai” kept getting delayed. With Nicole being a busy Hollywood actress, it’s extremely difficult to coordinate their schedules. So now WKW has to rush to get another film started. This article cited “sources close to Wong Kar-wai” as saying that the reason filming is being delayed till 2007 is not only because the script is still undergoing revision, but also because WKW is still looking for a male lead to team with international superstar Nicole Kidman. Even though this film is being “announced” in the Berlin Film Festival, they only showed a poster with a “silhouette”. There was no mention of the female and male leads. “Wong Kar-Wai has decided to postpone the production of The Lady from Shanghai to 2007 and shift his focus on the hurricane Katrina project. 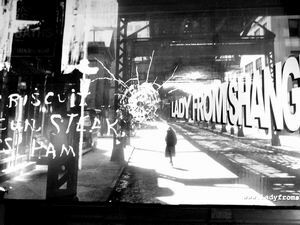 A teaser poster of The Lady from Shanghai has appeared during the Berlin Film Festival. Someone from a French distribution company said Wong had difficulty of casting the right leading man to work with Nicole Kidman. This image shows a large portion of the teaser poster appeared at the Berlin International Film Festival. It shows a lady walking in a street alone. Some kind of menu is written on the window glass and a bullet hole is visible on the right. The elevated rail line makes it looks more like a street in New York or Chicago, rather than Shanghai. Story of Lady from Shanghai is set at multiple locations around the world and Shanghai is only one of several cities to be featured in the film. Part of the URL of the official site is also reveal on the poster – www.ladyfromshanghai.com.